The lightweight and compact double stroller, with optimal agility for two. The Pliko Mini Twin maneuvers with ease and can be pushed with just one hand. 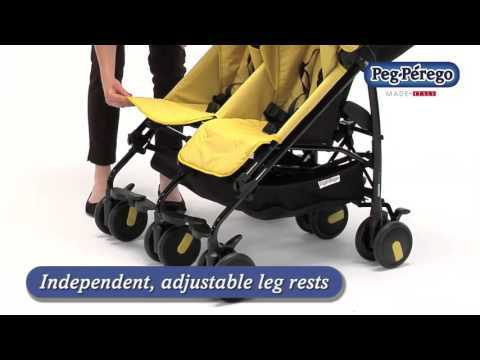 Check out this lightweight double stroller in action! The Pliko Mini Twin is the perfect stroller for an on-the-go lifestyle. Two children travel in comfort, while parent pushes with ease with this all-new twist on the classic Pliko Mini. This lightweight double option (weighing in at just 24 pounds), has an easy to use quick fold that lets the stroller stand on its own. An integrated pull handle to trolley the stroller is available for optimal transportation. A centrally located handle allows parents the capability to push the stroller with one hand. This extra handle is also attached to wheels that keep the stability of the Pliko Mini Twin intact and allow it to smoothly stroll with ease. The front wheels have ball bearings and offer both swivel or straight mode while the rear one-step foot brakes keep travel quick and easy. With the Pliko Mini Twin, children can travel at their own comfort. This unique double offers independent adjustable backrests and footrests. Parents will find the height-adjustable ergonomic handles to be a great asset and will love the roominess and storage capacity of the basket. Large, adjustable hoods keep little ones cool and protected from the elements. Premium Chassis Aluminum chassis with middle wheel stability. Lightweight Weighs just 24 pounds but can hold two children up to 45 pounds each. Stand Alone Stroller stands on its own when folded. One Hand Drive Central handle allows parent to maneuver the stroller with just one hand. Adjustable Handles Ergonomic handles are adjustable to suit the height preference of parents. Large Hoods Keep both babies covered with large hoods that protect from the elements. Pull Handle Integrated pull handle aids in closing the stroller and helps with transporting stroller when it is folded. Basket Roomy, practical storage basket can hold all of the essentials. Unfolded 33.5" x 30.25" x 40"